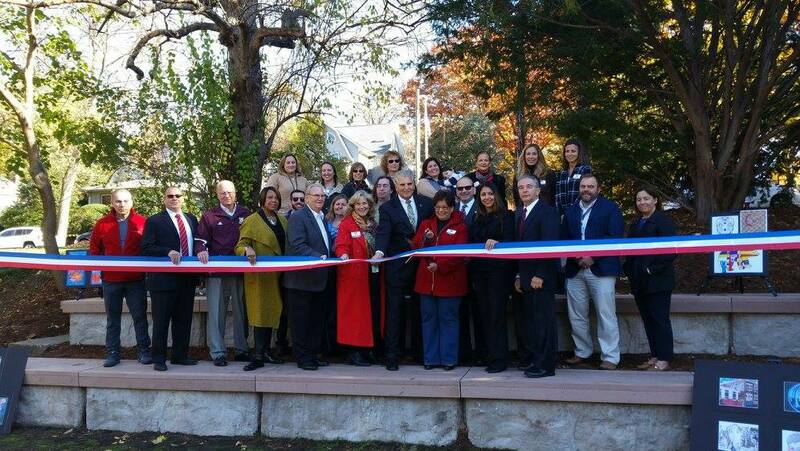 Nutley, NJ – On Monday, November 7th, Essex County Executive Joseph N. DiVincenzo, Jr. joined with representatives from the Nutley Educational Foundation, Nutley Public School District and the Passaic Valley Sewerage Commission to announce that the outdoor classroom and amphitheater in Essex County Yanticaw Park has been completed. The learning facility is located on the bank of the Third River and can be used by all grades K-12 for new learning opportunities. “The outdoor classroom project is a great example of various government and public school organizations working together to create a facility to enhance our children’s education and understanding of nature,” DiVincenzo said. “The public depends on Yanticaw Park and our other county parks for recreation, but this project shows their potential as an educational resource,” he added. “The Nutley Educational Foundation is pleased and proud to have been able to support this wonderful addition to our Township and our school district. This opportunity, brought to us by the Middle School science teachers, met all of the objectives of our mission statement and should serve as a reminder of what can be accomplished when everyone works together,” said Nutley Educational Foundation President Lorraine B. Kucinski. “A heartfelt thanks to PVSC, County Executive DiVincenzo and the Essex Board of Freeholders, Nutley’s Board of Education and Township Commissioners and especially the NEF Trustees and Committee Volunteers,” she added. “The Nutley Public Schools are fortunate to be able to provide this tremendous opportunity for our students to be able to extend their learning beyond the four walls of the traditional classroom, and grateful for the partnership with Essex County, the Passaic Valley Sewer Commission and the Nutley Educational Foundation, who helped to make this vision possible,” said Dr. Julie Glazer, Superintendent of the Nutley Public Schools. “PVSC is pleased to partner with Essex County and the Nutley School system to create this outdoor classroom in Yanticaw Park,” Passaic Valley Sewerage Commission Chairman Thomas Tucci. “We hope that Nutley children and residents of Essex County will be able to use and enjoy this unique learning environment for years to come. Our goal is to help give children the opportunity to spend more time outdoors, especially in a natural setting. An outdoor classroom should give them opportunities to interact with nature, study the environment or study any school subject for that matter,” he added. Construction of the outdoor classroom was started in July and completed in about three months. The facility was modeled after a similar outdoor learning center created by the Bloomfield Public School District in Bloomfield’s Clark’s Pond in 2012. Science teachers from the Nutley School District presented the idea to the Nutley Educational Foundation and the Passaic Valley Sewerage Commission, and gained permission from Essex County to utilize the space. The outdoor classroom consists of three tiers of seating, approximately 30 feet in width, built into the natural slope of the park. There is enough seating to accommodate about 30 students. A podium of reclaimed wood was used to create a podium in front of the stadium seating. When seated in the amphitheater, students are looking toward the Third River. In addition to the creation of the seating area, overgrown brush in the area was removed and new landscaping and additional trees have been planted. “I especially like coming to these events because is love to see the unveiling of new projects to enhance our parks and communities. This outdoor facility will provide our students with great opportunities to participate in a unique learning environment,” Assembly Speaker Emeritus Sheila Oliver said. “This project is all about helping our students. Things like this will give them an opportunity to experience nature and spend necessary time away from computers and social media,” Assemblyman Ralph Caputo added. “I really like the look of this amphitheater. Instead of overgrown brush, it’s been transformed into a space that can be used by children to learn and explore nature and other subjects,” Freeholder Cynthia Toro said. “I look forward to working with our County Executive and other partners to make Essex County better and this certainly helps. As a retired teacher, I believe education is important and this new facility certain will contribute to this,” Freeholder Patricia Sebold said. The Nutley Educational Foundation raised about $3,600 to purchase the supplies to create the classroom. The PVSC provided the labor to construct the facility. In 2003, the playground near Centre Street was upgraded with new equipment and a rubberized safety surface as part of the County’s Executive’s initiative to modernize playgrounds in every County park. In 2006, the playground was named the “Essex County Frank A. Cocchiola Playground” in honor of the late Frank Cocchiola, who served on the Nutley Board of Commissioners for 28 years. Pathways were repaired in 2006 and Park Drive was reconstructed and repaved in 2008. In 2010, the John Henry Walker Field and two baseball fields along Passaic Avenue were renovated and regraded, pathways in the western section of the park were repaired, the basketball court was renovated, the field house on Park Drive was renovated, the bocce court was modernized, perimeter fencing was repaired, and sidewalks and steps were reconstructed. Also in 2010, the three fields off of Park Drive were named as the “Essex County Carmen A. Orechio Recreation Complex” in honor of Mr. Orechio for his more than 40 years of public service as President of the NJ State Senate and Mayor and Commissioner of Nutley. The Essex County Park System was created in 1895 and is the first county park system established in the United States. The Park System consists of more than 6,000 acres and has 22 parks, five reservations, an environmental center, a zoo, Treetop Adventure Course, ice skating rink, roller skating rink, three public golf courses, golf driving range, two miniature golf courses, three off-leash dog facilities, a castle and the Presby Memorial Iris Gardens. Land for Yanticaw Park was acquired between 1911 and 1914. At 28.75 acres, it is the 11th largest park in the Essex system.